You'll find just about everything you need to know about fraternal twins here. We've also gathered together some facts and stats to help you understand this part of the twin world. Fraternal twins make up approximately 75% of the twin population and can be boy/boy, girl/girl, or boy/girl sets. Fraternal, or "dizygotic", twins happen when Mom releases two eggs (either at the same or different times during her cycle), and different sperm fertilize each egg. Fraternal twins share up to 50% of their genes, and are no more alike or different than any two siblings would be. The similarity between fraternal twins can be close to identical - there are many fraternal twins that look identical - even more identical than some identical twins! The difference between fraternal and identical twins is that fraternal twins are two separate eggs fertilized by two separate sperm to form two separate embryos and then make two separate babies. Identical twins are formed when one fertilized egg divides into two separate embryos to make two babies. Superfecundation happens when Mom ovulates more than one egg during her cycle (a process called hyperovulation), and different sperm fertilizes two eggs. Mom may have inherited a gene that causes hyperovulation, which means she releases more than one egg during her regular cycles, thus the saying "twins are hereditary" or the common question "do twins run in your family". Many fertility drugs cause Mom to hyperovluate as well. Superfetation happens when Mom is already pregnant when she ovulates and releases another egg - sometimes as long as 24 days after the first egg is released. A different sperm then fertilizes the second egg. While the twins have different conception dates the babies will most likely be delivered at the same time, although they may be different sizes and at different developmental stages. In vitro fertilization - when fertilized eggs are implanted in Mom - is a form of superfetation. Superfetation also can happen when Mom undergoes fertilization treatments where fertilized eggs are implanted (in vitro), and then releases an egg during her cycle, which is also fertilized. Since fraternal twins are formed by two separate eggs fertilized by two different sperm, fraternal twins can have different fathers. Africa sees the highest incidence of fraternal twins; Asia, the lowest. 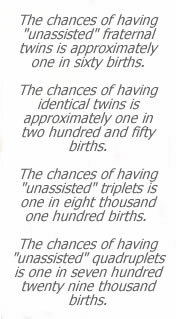 Female fraternal twins have a one in 17 chance of giving birth to their own set of fraternal twins.